Another win for our side: We have come into written correspondence from the District Attorney of Siskiyou County which is rejecting to prosecute suction dredgers for not having a permit as a result of the recent Third Appellate published Decision. Just as a cautionary note on this before you go out and start suction dredging in California without a permit, there is nothing preventing the California Attorney General’s office from attempting to prosecute. Having said that, I’ll make another prediction that if any prosecution of suction dredgers is attempted by the State, we would throw our money at the defense. Based upon the extensive language about our mining rights in the Rinehart Decision, I personally believe such a case would not proceed beyond a preliminary hearing. Third Appellate Rejects Karuk Motion for Reconsideration! Here is another bit of good news for our side: The Karuks and their allies recently filed a motion with the Third Appellate Court to reconsider its landmark Decision on behalf of Brandon Rinehart. They are suggesting that Brandon never had a federal mining claim in the first place, because the State owns the bottom of waterways! These guys just never give up! Never mind that the State withdrew from this argument during the initial trial, and continue to charge Brandon property taxes on his federal mining claim! We immediately replied with a brief of our own, asking the Third Appellate to reject the Karuk’s motion – which they ultimately did. Here is an update Memo from our attorney. Almost Three Miles of New Mining Properties! 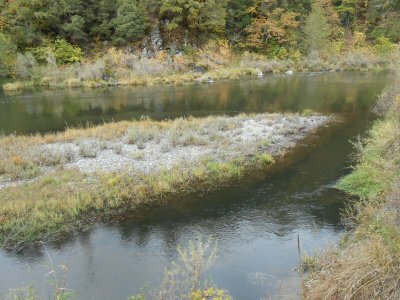 I am very pleased to announce that we have recently purchased nearly 3 miles along one of the historically-richest portions of the Klamath River. This is a very substantial addition to our extensive existing properties. We are not ready to disclose the new location, but I will say that it is reasonably close to Happy Camp. While I have not personally prospected there, one of my earlier mining partners did a few weeks of dredging in that area just before the dredge moratorium, and his gold discovery was on the order of the nuggets we gave away in the most recent drawing. It is going to take us a while to pull images, video and initial prospecting results together, mainly because some of the area is only accessible by boat or raft. The Forest Service has consented to allow us to place our own lock on the gate which blocks the main access road during the off-season months. The gate is open during the summer. They have requested that we minimize use during the wet season so we don’t tear up the road. We have initial prospecting teams already doing some preliminary work, and a rafting trip is planned so we can view the entire stretch of river. “Derrick and I walked to the end of one road and found a gravel bar that is probably three times the size of K-15A. There is evidence of major historical mining being done on the bar that has left tailing rows and what looks to have been a berm for diverting water. I sampled one place where there was an outcropping of bedrock that didn’t look like it had been mined before and found some gold in a small crack where the bedrock meets the bar about 200 yards from the river. We are going to spend a few days scouting and sampling the area both on the bar and high up on the hillsides. You can tell by looking at the hillside where the trees change in type and size just how far up the hill the old-timers mined before. Every so often, you can see an area up in the brush where there is an old rotting big tree stump where they must have skipped over with their operation. I haven’t even begun to look at any of the lower part of the new properties yet. They may only be accessible by boat. But I must say I am really excited about what I have seen and Derrick was taken aback by what he saw and said he never even imagined that the claim was there because it has been overlooked for such a long time. That and the fact that a whole new concept of mining here could possibly be done with a little ingenuity and some modification to equipment. I haven’t been this excited about a claim in a long time! I mentioned to Rich Krimm that when he comes up in a few weeks, we need to spend a few days just scouting the area and throwing out different ideas of what could be done using new prospecting methods and how we would need to modify our existing gear. I am already thinking of ways I could modify my dredge to operate on dry land far away from the river. Maybe I will become a dry land dredger (LOL)! 1 pennyweight of gold nuggets: Ronald Watson of Poulsbo, WA; Alexander Watko of Walla Walla, WA; Roy Harrison of Quartzsite, AZ; Joseph Martin of Willits, CA; Raymond Dagle of Cottonwood, CA; William Frese of Cincinnati, OH; Ronald Morris of Eagle Point, OR; Daniel Cutshall of Bishop, CA; Brian Mix of Camino, CA; Charles Alberts of Dixon, CA; Chris Saunders of Moore, OK; Ray Derrick of Livingston, TX; Gene Deal of Tulelake, CA; Randy Peacock of Colorado City, TX; Les Martin of Klamath Falls, OR; Robert Gauf of Clear Lake, CA; Ross Benson Hot Springs Village AR; Bill Pechtel III of Medford, OR; John Beisner of Anaheim, CA and Dennis Scharosch of Sacramento, CA. Congratulations to all the winners! If things keep going our way for a while longer, we are all going to win the big prize of being free to get back in the water in California with our suction dredges. Just like going underwater and making a withdraw from the bank; that’s the best prize ever!! 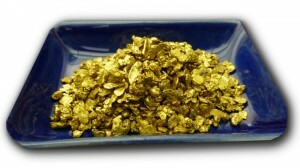 I have a good idea where to go to regenerate my inventory of gold nuggets. Many of you guys also have ideas about this. I want to thank all of you who responded to our calls for participation. 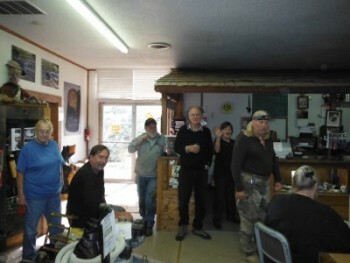 This was another successful legal fund-raiser. Any contributions which have come in since the drawing will automatically generate tickets for our next fund-raiser — which will be for twenty 10th-ounce American Gold Eagles and a brand new 4-inch Proline dredge. The next drawing will take place on 27 February. Proline Donated the 4-inch Dredge to Our Next Legal Fund Drawing! 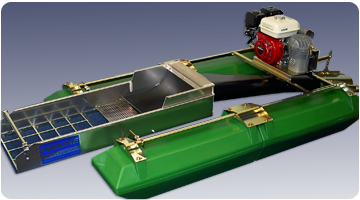 “I’ll be providing you with our best-selling 4” dredge model. It will be equipped with the GX200 Honda, our HP400 pump, T80 air compressor, 15ft of 4” dredge hose, and one of our swivel tips. As discussed, the winner will pay for freight or arrange it himself. We get very good shipping rates, and don’t charge any handling or crating fees. Best regards,” Jeff at Proline Mining Equipment, INC. (209) 878-3770. As we hopefully transition into California suction dredging once again, I hope you guys will remember those companies in the industry that have stood with us in our efforts to overcome prohibitive over-regulation. Proline makes some of the best small-scale mining equipment in the world. Like many of us, I do mining on a part time basis and that means I have a day job. One of the things many of today’s progressive employers do is partner with organizations such as United Way. Together, the United Way partnered with the employers, offer community services in many ways with programs such the “Charitable Gift Campaign.” About this time every year, employers have a “campaign drive” for employees to be able to donate through payroll deductions for deserving organizations such as the New 49ers Legal Fund. As a 501.c organization, The New 49er Legal Fund is eligible for this and similar programs. This means you can have your employer take pre-tax donations and have them given directly to the New 49er Legal fund through payroll deductions via the United Way. The best part is there is no fee or split of the donations and it all goes to the New 49ers Legal Fund! As a bonus, many employers offer dollar-matching of the donations. That means if you donate $5 a pay period, your employer matches the $5 and the New 49er Legal Fund gets $10! While we are at it, there are some employers who are not partnered with organizations such as The United Way, but may have a direct donation program in place. This also often incudes dollar-matching. These programs vary from employer to employer, so be sure to check with yours for specific details. So please check with your employer to see if there are any such programs they have. If you know any other similar program be sure to let us know so we can spread the word and take advantage of these fine programs. To make sure everything is in place, and to start us off on the right foot, I started us off with a $5 per pay period donation for all of 2015. We want to extend a warm welcome to Tony M. Balderrama who has taken over in our main office as our new Office Manager/Accountant. The position was held by Marcy Charlan for 15 years. Marcy decided to make a career change this past spring and is now owner and manager of a doughnut shop in Medford, Oregon. She has helped out considerably in the changeover, and Tony still calls on her from time to time. 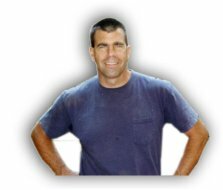 Tony is highly qualified for this job, is very service oriented, and is very personable in person and on the phone. He is a good addition to our office team and we feel very lucky to have him. As it turns out, during the period of around 6 months after Marcy left, but before Tony started, others who did their best to pick up the slack made some errors in the computer entries. These errors then turned up on some member statements that have been sent out. Some members have voiced concerns to the office. The good news is that we also keep a separate set of hard copy records on all payments received. Tony and the other staff in our office are, step by step, comparing hard copy records to computer records and making corrections where needed in our computerized billing system. This is to assure you we are working on it. I ask that you be patient with us; because we have thousands of members, and the office billing functions are more complex than you might assume. In any event, if you see any errors in your monthly or annual account statement, please call Tony or Bonnie at 530 493-2012 and they will make every effort to accommodate you. Signing up also places you on our Political Action Team. Things happen so fast these days; it takes too long to organize political action through the U.S. mail. As an example, just a few years ago, in concert with other mining organizations, our Internet Action Team killed anti-mining legislation in Oregon in less than a week. We generated a big portion of the recent letters to the Third Appellate Court by contacting our supporters this way. All of these future battles will be organized over the Internet since it is so much faster. Please join us in the battle to maintain our remaining freedoms!